JOHANNESBURG (Reuters) - Standard & Poor's downgraded South Africa's local debt by one notch to BBB on Friday but kept its sovereign credit rating unchanged at BBB-, one level above "junk" status, while saying the economy was still struggling. 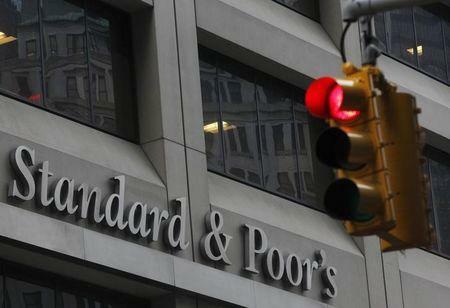 S&P retained its negative outlook on the rating. A cut would take South Africa below investment grade, pushing its bonds out of global indices and preventing institutional investors from buying its debt. The decision means South Africa still holds investment-grade status with all three major agencies, although Fitch and S&P each assign it their lowest such grade with a negative outlook. The rand was more than 2 percent higher against the dollar after the ratings release, extending gains made after jobs data from the United States disappointed. About 90 percent of South Africa's 2.4 trillion rand ($173 billion) debt is denominated in the local currency. S&P said the pace of economic growth was still a ratings weakness and warned that political tensions could hamper reform and other efforts to boost GDP as well as undermining investor confidence and exchange rates. The economy is forecast to grow just 0.5 percent this year. "If GDP growth tends be slower or lower than what we expect, then that can be a big pressure point for the economic assessment, "S&P Global Ratings analyst Gardner Rusike said in an interview on Talk Radio 702. Fitch and Moody's also warned about political turmoil, saying it could derail economic growth, when they affirmed their ratings last week. Policymakers have been trying to avert a downgrade to "junk" as Africa's most industrialised economy needs to borrow about 165 billion rand ($12 billion) this fiscal year to help plug its budget deficit. Treasury Director General Lungisa Fuzile told Talk Radio 702 after S&P's decision that growing GDP will require further fiscal consolidation. S&P said a tug-of-war in the ruling African National Congress (ANC) could impact the economy negatively. The ANC this week backed scandal-plagued President Jacob Zuma after several officials called for him to resign. Since taking office in 2009, Zuma, 74, has been plagued by accusations of corruption, which he has repeatedly denied. A prolonged investigation into Finance Minister Pravin Gordhan this year also rattled financial markets. The state prosecutor dropped fraud charges against Gordhan, executing a U-turn in a case that has drawn accusations of political meddling. Chief economist at Standard Charted Razia Khan said the rand may rally in a knee-jerk fashion briefly but "the pace of South Africa's growth remains a key ratings weakness." Chief economist at Nedbank Mohammed Nalla concurred. "The important thing is that we won't be shut out of global bond indices, but what the downgrade of the local currency rating does is send a strong message to policymakers that a lot still needs to be done to turn around the economy," he said.